Two years ago, I was sent an email by the co-creator of webseries Jules and Monty. What I discovered when I went to watch these Tufts University students’ vlog-style reimagining of Romeo and Juliet in a college setting was not simply a charming production but also a meaningful symbol of how the accessibility of web distribution has reshaped the creativity of young producers. Here you have a group of college students who saw an independently produced webseries (The Lizzie Bennet Diaries) and its cultural footprint and said “we can do that,” and then went ahead and did it thanks to the help of a campus TV station with an interest in making web content and the mainstreaming of the equipment/software necessary to make it happen. I wrote about Jules and Monty both on Tumblr and here on the blog, but the students at Tufts—with co-creators Ed Rosini and Imogen Browder now branded as Neat-O Productions—have kept creating. But these creations have taken a different path than Jules and Monty—that show caught on with the fan communities that had emerged around the literary webseries of the moment, generating over eight thousand views of its finale and over twenty for its premiere. But followup webseries Wavejacked failed to ignite in the same way: it was less romantic, pushed the boundaries of genre, and latched onto a cultural reference point—old time radio plays, by way of Welcome to Night Vale at times—that didn’t necessarily appeal to their existing audience. And yet its success should be measured less in terms of views—still over a thousand for the finale, the measure of true viewership—and more in the fact that its creators didn’t just adapt another romance. They told a different story, explored different themes, and made a conscious effort to engage with LGBT representation in the process. The end result could be a bit scattered (in part due to a fragmented release structure), but it would have been easy to just fall into a pattern and they resisted that. Pantheon University, this year’s production, represents the apex of the idea of college students making their own webseries by combining the media industry happening around them and their own creative impulses. Like Jules and Monty, Pantheon is an adaptation reimagining stories in a college setting, but in this case it’s the sprawling Greek mythology. This gives them the freedom to explore genre, moving between different tones and styles as the characters and their stories shift. They’ve even been inspired by the rise in Netflix’s all-at-once distribution pattern to build a puzzle-like structure, with the episodes released at once and able to be watched in any order (although with a suggested order). If Wavejacked was Neat-O pushing the boundaries of what they were interested in exploring and how they wanted to explore it, Pantheon University is channeling that ambition into creating something truly distinct. The relationship between Pemberley Digital and PBS Digital Studios—the two producers behind Frankenstein M.D.—makes a lot of sense to those familiar with both parties involved: both have taken their respective “projects” as creators and translated them for an online audience, taking advantage of the affordances of platforms like YouTube to create content that connects with those consuming content outside of “traditional” spaces of distribution. In this way, the idea of combining the former’s literary webseries development with the latter’s investment in creating STEM-related content on digital platforms with an adaptation of Frankenstein makes perfect sense to those following along. At the same time, however, their inherent philosophical compatibility must nonetheless negotiate the fact those philosophies have been heading toward two different goals: whereas Pemberley Digital has been developing web franchises that can be spun off into ancillary projects like books or merchandise, PBS Digital Studios remains bounded within the logics of public television where its primary goal is serving the public interest. And so while web content has proved a valuable tool to both producers within the contemporary web video environment, building connections with audiences from both profit and non-profit perspectives, the convergence of these two companies nonetheless requires each to adapt accordingly. Whereas unscripted YouTube content related to science and culture showcases PBS translating its interest in documentary programming into a more web-friendly format, how does one design a scripted webseries to fit into that mission? And if you’re the one designing that webseries, how do your goals for audience engagement change when views might become less important than connecting with audiences in an educational—or at least informative—way? While the interview I posted yesterday touched on a number of these issues, and the series itself will ultimately stand as the answer to this question, I wanted to create a second part to the interview focused on this intersection of approaches to web video content. Some of these questions and answers also appear in the previous interview with executive producer Bernie Su, star Anna Lore, and PBS Digital Studios senior director Matthew Graham, but they’re presented here to isolate the relationship between the two companies and their relationship with webseries, transmedia, and the various component parts that will make up Frankenstein M.D. as it rolls out over the next few months. Cultural Learnings: From a PBS Digital Studios perspective, this is the first time you’ve developed a fictional webseries of this kind—what drew you to Pemberley Digital as a partner for this milestone? During the PBS executive session [at July’s TCA Press Tour], president and CEO Paula Kerger was talking about how PBS has audiences at a young age, and then it gets them again when they’re older, but sort of loses them in the middle. So you see this specifically serving a similar function from an educational perspective for one of those generations in between? Graham: Absolutely. I think it’s an incredibly exciting opportunity to reach these younger folks with higher-quality, educational, entertaining content. The mission’s a little different when you’re talking about very young kids: there the PBS kids team does incredible work structuring the content so that it’s age appropriate and they’re actually learning letters. Here it’s a little bit more “Sure, there is science information that the audience is consuming, but it’s a little bit more of a cultural exposure: STEM careers are cool, this is an exciting space, there’s a lot of exciting stuff happening around it.” So it’s more kind of inspiring people to think about these career directions as opposed to trying to teach them science. On the one hand, Frankenstein M.D. is very familiar: the third full series from Pemberley Digital following the Emmy-winning The Lizzie Bennett Diaries and followup Emma Approved, the series is a webseries adaptation of a classic novel featuring a female protagonist (in this case reimagining Victor Frankenstein as Victoria). Fans of their previous series will find both a similar sense of humor and a similar sense of purpose when the series debuts its first three episodes tomorrow, with the series settling into a familiar Tuesday-Friday pattern until its finale on Halloween. On the other hand, though, Frankenstein M.D. is a departure in two keys ways. The first is that, by departing from Austen and arriving at Mary Shelley, Pemberley is heading into new generic territory, balancing its direct address vlog style with the well-known results of Dr. Frankenstein’s experiments. However, the second—and I would argue more substantial—difference is that they’re working with a traditional “network,” partnering with PBS Digital Studios in launching the series. In the first part of this wide-ranging interview with executive producer Bernie Su, star Anna Lore (Victoria Frankenstein), and PBS Digital Studios senior director Matthew Graham, they discuss the development of a series that one might classify as an experiment for all parties. Part Two of the interview explores the industrial side of the series’ debut in greater detail. From your perspective, Bernie, were your discussions with PBS always centered on Frankenstein? Were there other projects considered for this partnership? Executive Producer Bernie Su: It was “How about Frankenstein? Let’s do that!” It was literally that. It never got past it. I don’t think we even mentioned a second project. It was like “That’s great. 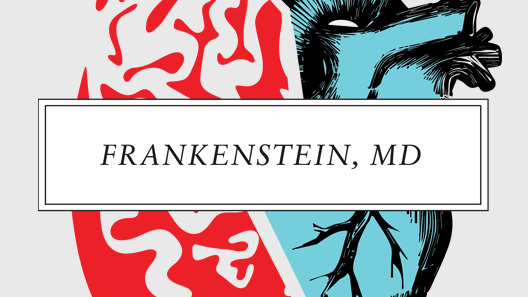 What would be your take on that?” And then it was the idea of the modern medical student and how we can touch upon modern science and how we’re actually close scientifically to doing stuff—bringing people back to life, what is life, all that stuff—that Frankenstein does in the novel. So it made a lot of sense given that our audience has been wanting us to push toward STEM, so this was just a great opportunity that seemed like a really good match right out of the gate and it was really easy. Technically speaking, Pemberley Digital’s relationship with PBS Digital Studios is not that dissimilar to their relationship with DECA, or with any other Multi-channel Network operating in the space of web video (specifically YouTube). When Frankenstein, M.D. launches on August 19 with three episodes, beginning a 24-episode run that those videos will live on YouTube through a range of different channels, and follow the Tuesday/Friday distribution model that fans of Pemberley Digital’s The Lizzie Bennet Diaries (which I’ve written about here and here) and Emma Approved will be familiar with. At the same time, though, PBS is the first major “network” that Pemberley Digital has partnered with, in the sense that it expands beyond the digital space and into the realm of traditional television. Whereas I imagine most audiences of even The Lizzie Bennet Diaries and Emma Approved couldn’t describe what DECA is or what it does, PBS is a known brand entity, with certain expectations and a place within cultural discourse. It is also a public broadcaster, with public interest mandates distinct from DECA, and which have never been connected to scripted web content on this level previously. I spoke with PBS Digital Studios senior director Matt Graham, Pemberley Digital producer Bernie Su, and series star Anna Lore (who plays Victoria Franktenstein) about Frankenstein, M.D. earlier today, and I’ll be posting that interview before the August 19 launch. In the meantime, though, here’s what we know about the webseries. In the words of the press release, Frankenstein, M.D. “reimagines the title character as Victoria Frankenstein, an obsessive, eccentric prodigy determined to prove herself in the male-dominated fields of science and medicine. Her medical experiments are revisited in a modern university setting.” The specific focus on confronting women in STEM fields was presumed based on the choice to reimagine Victor as Victoria, but it is notably central to the series’ framework in the press material. She is also a Ph.D./MD student, similar to the framing of Lizzie Bennet as a Masters student in The Lizzie Bennet Diaries. As noted, Frankenstein M.D. will run for 24 episodes, running—similar to Pemberley Digital’s other webseries—five to eight minutes each, with its final episode not-so-coincidentally scheduled for Friday, October 31st. In advance of the August 19 premiere, Pemberley Digital will unveil the first two episodes of the series at LeakyCon in Orlando, which runs from July 30-August 4. Anna Lore‘s Victoria will be joined by four other characters: her colleague Iggy DeLacey (played by YouTube comedian Steve Zaragoza, and the series’ take on Igor), her mentor Dr. Waldman (Kevin Rock), as well as her childhood friends Eli (Brendan Bradley) and Rory (Sarah Fletcher). They’ll be part of her in-world YouTube science series, in which she will be “explaining complex biological and medical concepts to a general audience.” Su suggested during a Reddit AMA that there would be videos that exist outside of the PBS Digital Studios channel, so it would seem possible we’ll be seeing videos featuring these characters interacting outside of the context of the “formal” YouTube series that she is creating. In terms of plot, I imagine our general understanding of Mary Shelley’s novel gives us a sense of where things are headed, but the press release suggests that “as Frankenstein pursues her boldest line of research yet, she makes a shocking series of discoveries that could potentially endanger not only her career, but her life and the lives of her friends.” It definitely sounds like the most high-stakes plot Pemberley Digital has taken on. Joe Hanson, host of PBS Digital Studios’ It’s Okay To Be Smart, is serving as the science consultant for the series, and it’s being filmed at YouTube Space LA. We’re reportedly getting our first glimpse of the series—which began production over the weekend—ahead of the panel, so there will likely be more details available later today. Update: The footage screened was pulled from multiple episodes. 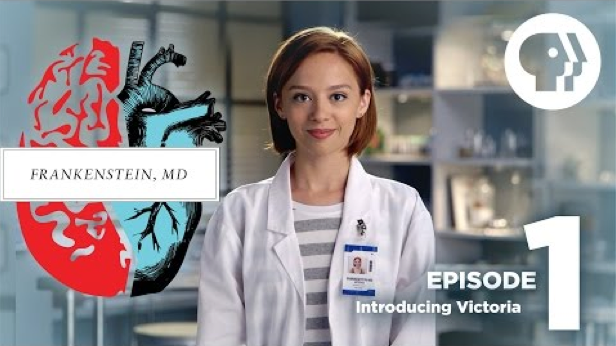 It features Victoria welcoming the audience to Frankenstein, M.D. (suggesting the name of the webseries is also the name of the in-world YouTube series), and then shifts to a scene featuring Iggy hooking himself up to some sort of electrocution device. The tone is fairly comic (Iggy reminds Victoria they’re not officially doctors yet, before electrocuting himself), although the subsequent scene between Victoria and Dr. Waldman is more plot-driven, as she focuses on another Doctor who sounds like a beacon of misogyny. Notably, for existing Pemberley Digital fans, the format is also shifting once more—there is slightly more of a sitcom-style filming energy, in which direct address is paired with a more dynamic camera style that takes an entirely different angle (versus the “second camera” that Emma Approve has used to occasionally get a second perspective). Since I originally wrote a Tumblr post about it, I’ve been following college-set Romeo & Juliet adaptation webseries Jules and Monty, which wraps up its eighteen-episode run on Monday (May 5th). As that Tumblr post suggests, some of this has to do with a general appreciation of what the project represents, and the way the webseries form gives real college students the chance to produce and then distribute something that can reach potential fans in the same places where other big-name projects can be found. However, the show itself has been a compelling take on the material, and has been pushing at a question I’ve been puzzling over regarding webseries—and television more broadly, really—for some time. It began with two relatively concurrent events. The first was the release of Episode 14 of the series, in which Jules is confronted by her brother, Cliff. In a response to that post, director Evey Reidy notes that the trigger warning conversation is ongoing within the theater community at Tufts (where the webseries and its cast and crew are based), placing this as part of a broader conversation within the world of the cast and crew. In both cases, the creative team reveals their belief protecting their viewers outweighs any sort of narrative purity (which would have, one presumes, maintained the shock of the moment rather than “spoiling” that Cliff would strike Juliet in the midst of their argument, a decision that reflects many adaptations of the source material). I heard about Twenties from numerous people online who shared it with the story of Lena Waithe’s struggle to get the show made: the networks all express their love for the project, but suggest there isn’t an audience for these stories (or that they already exist), which is paraphrasing to hide the fact they’re freaking out over the show’s intersection of race and sexuality. It’s a clear effort to avoid further ghettoizing the series, as Waithe is unwilling to abandon her belief that stories about black women (and specifically black queer women) deserve a space on cable. It’s an admirable position that more people need to take—and more executives need to recognize—in order to impart real change in how African American audiences are served in our contemporary moment. It’s also a position that’s going to be very difficult for Waithe to insist upon given the way her distribution of the series’ four-part pilot presentation and the basic premise of that presentation fit comfortably into web series logics.